Homepage > PEUGEOT 4007 DOG GUARD [Fits all 4007 models] 2.2 HDI GENUINE PEUGEOT ACCESSORY! PEUGEOT 4007 DOG GUARD [Fits all 4007 models] 2.2 HDI GENUINE PEUGEOT ACCESSORY! The dog guard can be fitted and removed quickly and easily and is a must for the safe transportation of four legged friends. 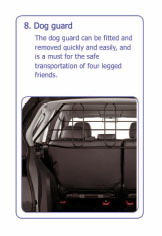 Product Description: The dog guard can be fitted and removed quickly and easily and is a must for the safe transportation of four legged friends. PEUGEOT 4007 REAR SIDE WINDOW SUN BLINDS [Fits all 4007 models] 2.2 HDI NEW!